Udder Augmentation is performed to enlarge small, underdeveloped, uneven udders, or those that have become uneven after long strainous calfrearing. By Surgically inserting an implant behind the Udder, results can be dramatic, depending on your preference. You most certinally can have larger, firmer, fuller udders after udder augmentation. Udder Augmentation usually starts with an incision under the udder, around the a quarter of the base under the hair. A pocket is created for the implant behind the entire udder mass tissue, or behing a muscle between the udder and chest wall. Depending on the type and manufacturer of your udder implant, it may already be filled and placed inside the pocket as is, or may be flat and then rolled while attached to small tube. This type of implant allows the surgeon to insert the implant through a very small incisin and tunnel it under your skin, and fill it with fluid to the desired size. The small tub is removed and the udder imlant remains filled and permanently sealed. And how about after it's done? 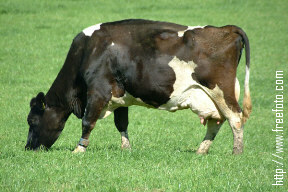 Udder Augmentation is usually performed as inbarn surgery. Following the surgery, you will wear approximatly 15 pounds of gauze dressing and a XXXXL Surgical Bra. This type bra will be worn for several weeks after surgery. Swelling and discoloration will occur but will subside. Vigorous activies, which are quite uncommon to Bovine, should be avioded. What should I ask my cosmetic Farmers' Surgeon? Beggers can not be choosers. There is a limited amount of Surgeons out there. However, you still have the limited luxury of choosing one. Is the Implant Fluid Dairy Safe? How long until I may nurse again? Can I get a Doctors' Note for the Bull? First, it's very important to make sure the fluid is Dairy Safe. Accidents unfortunatly do happen, and when they do, you do not wish to put your calf in jepordy. 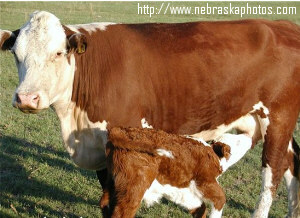 Speaking of nursing, you may want to make sure that you will be fully recovered from Surgery before allowing the little calves to pull and yank on your teats. Nothing could be more unexpected than having to return to Surgery for fixing a torn udder. Dr Farmer Wilcox (right) has been under investigation by the Bovine Freedom Coalition, for having a high fatality rate with simple bovine related surgeries. Further research found he is also a two time first place winner in the Kentucky Bar B Que Cook off. Cowsmopolitan.com can't stress enough that you should really get to know your surgeon! Most Farmers' Surgeons never make enough money to make ends meet, and sadly a few may not have YOUR best interest in mind. Be sure to further validate their professionalism by picking only those that don't look at you like you're some sort of dish. And as always, it's a cows life in the Herd, and pleasing your bull is one of them. Be sure to get as much proof for that Persistant Bull in the herd to know that you're now quite up to his activities. 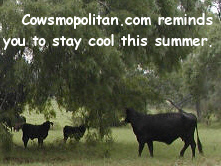 A note may not help matters, so try to graze sitting down and hiding behind other Heifers. Will he Notice? Lets be honest. You didn't do all this solely for your self esteem did you, after all, you are a cow. You want the bull to notice you! Well, most bulls don't actually look at the size of a Heifers' Udder, unless they are really into that sort of thing (17% is the latest estimate). What really matters to the Bull is how stetched out your udder is. It isnt' common for a Heifer to bear a dozen calves in her lifetime, however you don't want to look like that - a good surgeon will tighten up those stetched teats for a small fee. There are rumors your milk will turn sour after the implants. If you were smart enough to ensure the fluid is a dairy safe mixture, then by all means continue nurseing your calf, and once they are on their own, visit the Surgeon again for a little repairs.